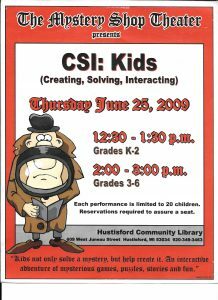 It was eight years ago today (June 25, 2009) that we performed the Grades 3-6 version of CSI: Kids (Creating, Solving, Interacting). The client was Hustisford Library in Wisconsin, and it was performed by Erica Sharpe and Mary Heitert. Erica is also the playwright of this script. 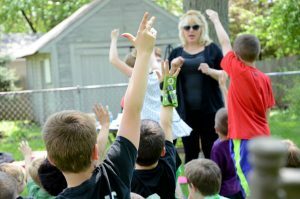 CSI: Kids is designed for small groups (20 children or under) and is perfect for libraries, park districts, birthday parties, scout troops, classrooms – any time kids gather to have fun. We also have a Grades K-2 version. Kids not only solve a mystery, but help to create it as well! Our one-hour product is an interactive adventure of mysterious games, puzzles, stories and fun! It involves theatre games, a build-a-story with a mystery theme and a Create Your Own Mystery where the children have the opportunity to not only act in the story, but make decisions that move the action forward. Are you ready to book your child’s next party? Call us today to lock in a date: 630-690-1105 or e-mail us at tms@TheMysteryShop.com.